FOREVER EVIL is the equivalent of a Michael Bay blockbuster, and I say that without a trace of contempt. There’s nothing subtle about it. There’s no real emotional hook. It’s crude storytelling – but it’s rollicking. If you’re after non-stop action, double-crosses and lots of explosions, look no further; FOREVER EVIL is a heck of a ride. The Justice League is dead. Of course, they’re not, and veteran readers don’t expect that to last, but that’s the status quo introduced by Geoff Johns and David Finch, and things immediately get worse from there. The Crime Syndicate from Earth-3 have arrived on Earth – evil analogues of Superman, Batman, Green Lantern and Wonder Woman – and are intent on ruling it through violence. With the Justice League out of the picture, there is no one to stand in the way of them – except for Lex Luthor, who bands together a motley crew of villains and becomes Earth’s only resisting force. The Injustice League is the planet’s only hope. FOREVER EVIL is very much a Lex Luthor story. In his mind, the arrival of The Crime Syndicate validates his incessant claims that humans can’t reply solely on aliens and super-powered beings to save them. Luthor doesn’t see himself as a villain; he’s a proponent for humanity, whose advocacy boarders on the insane. Teamed with his imperfect clone of Superman, Bizarro, as well as Captain Cold, Black Adam, Black Manta, Sinestro and more, Luthor combats his superior foes with gusto, which leads to some iconic moments, many of which fall into spoiler territory; suffice to say, the battle between Sinestro and Power Ring will live long in the memory; so too Ultraman’s fight with Black Adam. While I’ve never been a great admirer of David Finch’s artwork – entirely artistic bias rather than a slight on his ability – he is a fine artist for this project, and John plays to his strengths, allowing Finch to dynamically display the countless skirmishes. Character expressions rarely vary beyond furrowed brows, but hey, it’s the end of the world, they’re entitled to be stressed. Inker Richard Friend, colorist Sonia Oback and letterer Rob Leigh all collaborate nicely to make FOREVER EVIL altogether very pleasing on the eye. 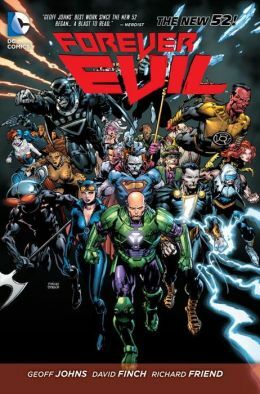 Johns leaves several threads hanging, plots that’ll undoubtedly be picked up on moving forward – but FOREVER EVIL wraps up with closure rarely evidenced in an ‘event’ series. Again, no spoilers, but the looming status quo will be very interesting indeed following Luthor’s decisions here. That’s the thing about comics – they are fluid. There is never time to enjoy what was; we’ve already moved on. FOREVER EVIL is a fun romp, which won’t resonate eternally, but is a thrilling ride while it lasts. My thanks to the publisher and Net Galley for providing a review copy.